4 - 0.........37" : Burton were in the game 10 minutes ago, now they are surely out of the tie. Zinchenko scores his first City goal in fortuitous style as he hits a first-time cross from the left that flies over Collins and goes into the net at the back post. City are in complete control now as a ball is clipped into the box for David Silva. He controls and then lays across for Jesus, who finishes off the post. VAR checked whether Silva was onside but he was in line. 2-0.... 30" : Burton are caught ball-watching as Sane passes to Gundogan, runs into the box unmarked and gets the ball back with a chipped pass. Sane controls and then sees his shot from a tight angle saved, but Jesus is quickest to react as he leaps and nods in the rebound from close range. 1 - 0 ... ... 5" : Burton's resistance is broken already. De Bruyne lays the ball off, continues his run into the box and gets between the two centre-backs to nod in a David Silva cross from about eight yards out. Manchester City are the first side in the top four tiers of English football to score at least seven goals in back-to-back matches in all competitions since Leeds United did so back in October 1967 (9-0 v Spora Luxembourg in the Fairs Cup and 7-0 v Chelsea in the top-flight). 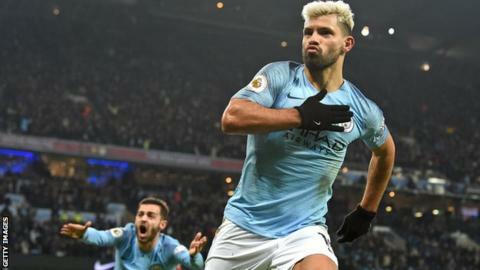 Manchester City have scored eight goals in a single match in any competition for the first time since November 1987, when they beat Huddersfield 10-1 in a second-tier encounter. Burton Albion's 9-0 defeat is the heaviest League Cup defeat by any side since Liverpool beat Fulham 10-0 back in September 1986, and is the largest ever margin of defeat in the semi-final of the competition. Man City's 9-0 victory is Pep Guardiola's joint-largest margin of victory as a manager, alongside Barcelona's 9-0 thrashing of L'Hospitalet during a Copa del Rey match in December 2011. Burton are the first League One side to reach this stage of the League Cup since Sheffield United in 2014/15 - the Blades were then managed by current Brewers boss Nigel Clough. Kevin De Bruyne has scored eight goals and assisted four in 12 League Cup appearances for City. Burton have eliminated a team from a higher division in four previous rounds of this season's League Cup, with only three teams ever eliminating five in one campaign - Swindon in 1968/69, Chester in 1974/75 and Bradford in 2012/13. City's last home League Cup match against a League One side was in September 2004, a 7-1 hammering of Barnsley. This will be third time Nigel Clough has managed in a League Cup semi-final, taking charge of Derby's second leg - a 2-4 defeat - against Manchester United in 2008-09 and leading Sheffield United to that stage in the 2014/15 campaign, losing to Tottenham. City are participating in their 11th League Cup semi-final, qualifying for the final on six occasions (1969-70, 1973-74, 1975-76, 2013-14, 2015-16 and 2017-18); this is Burton's first League Cup semi-final. City have progressed from their last 10 League Cup ties against sides from a lower division, including a 3-0 win at League One side Oxford United in this season's third round.